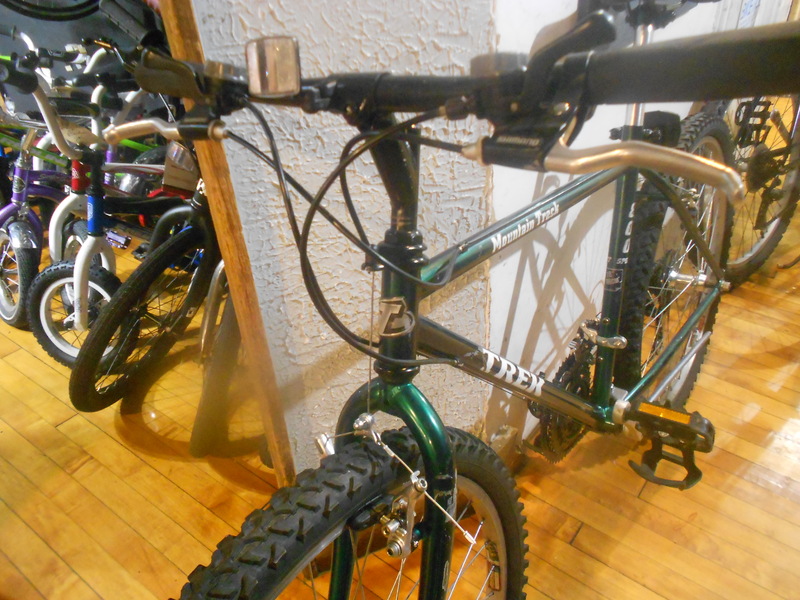 Trek Mountain Track 800 As Fully Serviced and Upgraded $300. As Fully Serviced and Upgraded with New Seat Post, New Sear Post Clamp, New Planer Comfort Classic Saddle, New Strapless Nylon Mini Toe Clips so that you may Bond with the Bicycle without being bound to It! Additionally Brake Cable Retro fitting for more dependable mechanical functional serviceability while eliminating the defectively designed original stock brake cabling system which Camouflages the Brake Cables, by design has reduced versatility and range of adjust ability and additionally manifests cable failure which is camouflaged so the cable can break unexpectedly on a continuous basis as manifested and camouflaged endangering rider operational safety so we modify the system making all cabling visible and directly inspect-able as well as inspected, checked and otherwise as necessary adjustable. We generally perform this Retro Fitting on any bicycle we service and inspect as Used for Resale and do not sell New Bicycles employing such substandard product design and our New Bicycle companies we sell do not employ them on their bicycles which are universally equipped with superior brakes by both design and manufacture. Yet we enjoy the fact that though flawed by design these normally defectively designed brakes are now retrofitted to reveal all cabling and eliminating the inherent design conflicts which enhances cable condition visibility, serviceability and does not contribute to and cause brake cable damage via design flaw which additionally manifests cable deterioration while concealing it eliminating the need to purchase an entire new brake to eliminate the brake system design flaws while enhancing adjust ability eliminating system design conflicts and enhancing the as manufactured brake performance $300.